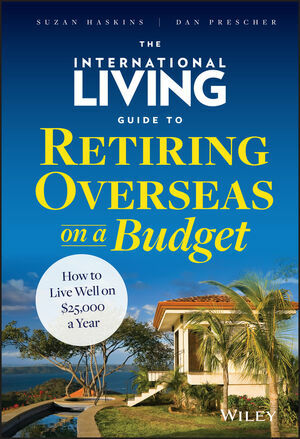 The International Living Guide to Retiring Overseas on a Budget provides a detailed guide to one of the least-known but most effective retirement strategies in today's chaotic economic environment: retiring abroad. The premise is simple: Enjoy a happier, healthier, more fulfilling retirement than you could possibly afford in the U.S. or Canada by finding the right overseas retirement haven. The book reveals those affordable havens and the strategies for successfully making the move that could save your retirement. Aimed at retirees and near-retirees in the U.S. and Canada, this book's strategies apply just as well to younger people and people with families who are looking for ways to improve their quality of life while at the same time lowering their cost of living. It includes solutions for the challenges of continuing to work and earn money abroad, too. As long-time contributors to the acknowledged leader in the field, International Living, authors Suzan Haskins and Dan Prescher have at their disposal more than thirty years of International Living experience and expertise in the topic. They've been writing about living overseas for more than 12 years and have created their own broad and deep body of work, including regular blogs on the topic for Huffington Post and AARP. The authors include information and strategies that can be successfully applied by anyone regardless of their political or economic opinions. For anyone who wants a happier, healthier, more affordable life, The International Living Guide to Retiring Overseas on a Budget shows you how to enjoy the romance and excitement of living abroad on an affordable budget. SUZAN HASKINS and DAN PRESCHER have been writing about life outside the United States for more than 12 years. Suzan and Dan ran a marketing firm in Omaha, Nebraska. In 2001, they moved to Quito, Ecuador to write for International Living. They have traveled and lived in numerous locations in Central and South America.